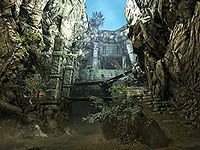 Sky Haven Temple is a large mountain-top fort that served as the major Blades temple and outpost in Skyrim, now long-abandoned and held in Forsworn territory. It has a long and rich history as the Blades main base in Skyrim. According to Esbern the temple has been abandoned for thousands of years, although the date it was last in use by the Blades is unknown. When it has been reclaimed by acting Grandmaster Delphine, she will attempt to rebuild the Blades, using it as a hidden base of operations. It is also the long-forgotten location of Alduin's Wall, a pictorial repository of ancient Akaviri dragonlore, including all the information ever gathered regarding Alduin, the Dragon Cult and their reign of terror. It also details a prophecy regarding their defeat. The last panel speaks of Alduin's return and his contending with the last Dragonborn at the end of time. More information on the history of the temple and Alduin's Wall can be found on the lore page. The temple can only be accessed once stage 30 of the quest Alduin's Wall has been reached. It is possible to discover the map marker beforehand, thus skipping the Forsworn and puzzles in the Karthspire by fast traveling during the quest, but entry to the temple is impossible. There are two zones, Sky Haven Temple and the exterior courtyard at the top of the Karthspire mountain. The interior consists of sleeping quarters, a dining hall, and a small armory. The courtyard is used for keeping lookout on the surrounding area and for training purposes. When you and Delphine have reclaimed the temple as the new headquarters of the Blades, you can bring up to three followers back to her and have them inducted into the Blades. Esbern offers the Dragonslayer's Blessing (stackable with divine blessings) that lasts for five days, giving you a greatly increased chance of critical hits against dragons, and will tell you about his dragon research, eventually offering a potion that grants the Dragon Infusion power, which causes you to take less damage from dragons. He will also offer the services of all the newly recruited Blades to aid you in fighting a dragon at a random dragon lair. If you fast travel to Sky Haven Temple after discovering it, you will actually land inside the Karthspire, in front of the door to the temple near the blood seal. Note: The quest Rebuilding the Blades allows you to make up to three of your followers into Blades. They leave their former lives and reside here. If any of them die after becoming a Blade, you cannot replace them. There are two separate external areas to the temple: from inside the Karthspire, and the courtyard at the top of the mountain. 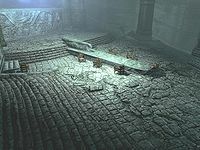 The only distinct features on the Karthspire exterior are a stone face covering the entrance, the "blood seal" on the ground before it bearing the Dragonborn symbol, and the large unlocked chest in the center of this cavern with unlit braziers at each corner. There is also a quicksilver ore vein on the right-hand wall as you enter this area. See here for full details of this area and the cave leading to it. The courtyard is on the top of the mountain and has an impressive field of vision, covering most of the main roads leading to and from Markarth. From the courtyard it is possible to see Reachwind Eyrie to the south, and Kolskeggr Mine to the north. The western view is blocked by part of the mountains in that direction, while the eastern view is blocked by the temple building. By climbing the rocks behind the building it is possible to see the waterfalls beside Old Hroldan Inn, Soljund's Sinkhole, and Sundered Towers to the east, while Markarth to the west is just visible. There are two open-sided buildings outside in the courtyard, one has several Hanging Moss growing off the roof. Both are initially empty. After returning from The Throat of the World quest, the first has two archery targets, one raised on a bale of hay, and a practice dummy installed into it. The building with an arched roof is used as a lookout post. When Esbern is found outside, he will stand looking out. When Delphine is outside, she will alternate between training alone, training with each of the Blade recruits, or standing lookout. Any recruits will alternate between training alone, training with Delphine, and wandering about the small area. There are also five trees with Juniper Berries and a tree stump with Mora Tapinella fungus growing on it around the courtyard. Although it is fairly small area, it is large enough for a dragon to land, giving the recruits some live targets to train on. When you first arrive in the company of Delphine and Esbern, the Temple will be quite dark; a light source is highly recommended. You enter after clearing the puzzles and traps, and passing the blood seal. At the top of a few flights of stairs from the door is the main room. This room is quite large and contains the main object of interest Alduin's Wall, which prophesies the Dragonborn's fate. Esbern will immediately rush over to it and start to inspect it while muttering to himself. This large room serves as the dining room, gathering room, and Esbern's study. In the middle of the lower part of the room is very long, empty stone dining table, with a smaller, empty wooden table. Esbern will set up his study to the right-hand side of the wall, and as the main quest progresses more books will be added to his table and bookcase. Most of his books are about dragons or the Dragonborn prophecy, and although he mentions a library in the Temple, one does not exist in-game. The multitude of stairs in the hall can be quite confusing. From the entrance, the left-hand and central stairs lead to the main room, while the right-hand stairs lead to the side of the same room and a set of stairs to the level above Alduin's Wall. The stairs in the northwest corner of the main room split: the left-hand fork leads to the front of the sleeping quarters, while the right-hand fork leads to halfway between the sleeping quarters and the area above the wall. The three sets of stairs in the area above the wall all lead to another small area containing five separate doors, all of which lead to the courtyard at the top of the mountain. The sleeping quarters in the northwestern corner initially contains seven unlocked chests containing minor loot, an empty set of shelves, five unowned single beds, and an old extinguished campfire. There are two empty tables in the middle of the room: a small square one and a larger wooden one with four chairs as well as two food barrels beside a pillar. The stone dining table in the main hall points almost directly at the armory to the west. On the wooden table in the armory is Dragonbane (a one-handed Akaviri katana), an Iron Dagger, an Iron Mace, and the One-handed skill book Mace Etiquette. Hanging on the wall to the left, there are six Blades Swords, and in between the wall and table there is an unlocked chest containing all five pieces of the Blades Equipment, and some septims. Once you have completed The Throat of the World and return to the temple, you will find that the braziers have all been lit, casting slightly more light, but still leaving large areas in darkness. There are now rugs scattered on the floor throughout. 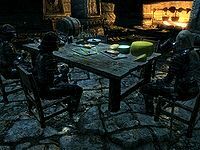 The long stone table in the main chamber containing Alduin's Wall now holds an Iron Greatsword, two bottles of Alto wine, a bottle of wine, two bottles of Nord mead, a cabbage, a salmon steak, a potato, a sprig of Snowberries, several loaves of bread and a wedge of cheese among fine crockery. Three chairs are arranged along either side of the table. To the left of the wall is a long wooden table and chair with various arms and armor: an iron helmet, a Banded Iron Shield, a Hunting Bow, a Steel Mace, a Dwarven Sword, an Iron War Axe, two loose Iron Arrows. On the floor to the left is a grindstone. The table and bookcase to the right of the wall is where Esbern can normally be found studying. On the table is a Salt Pile, a Garlic bulb, several rolls of paper and copies of The Book of the Dragonborn and a complete set of Brief History of the Empire volumes 1–4. To the right is a set of shelves holding eleven common books and several rarer or unique books including; Atlas of Dragons, Effects of the Elder Scrolls, Dragon Language: Myth no More, Flight from the Thalmor, and Remanada. 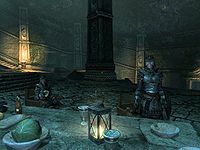 The armory still contains the same items left previously, while in the sleeping quarters the cooking fire has been relit and now has a cooking spit hanging in front. The beds and chests are exactly as you left them, however the small table now has a small mead barrel on top and the longer wooden table is now laid with two bottles of Alto wine, a bottle of wine, a baked potato, a portion of grilled leeks, a salmon steak, a seared slaughterfish steak, a potato, several loaves of bread, and pieces of cheese. The set of shelves are now filled with clutter. All items are free to take when you arrive. This changes when you receive the quest Paarthurnax, when Esbern tells you that the Blades will not offer support until the quest is complete. If it is left uncompleted all items in Sky Haven Temple will be considered owned, but will be free to take again after the quest is completed. The book Annals of the Dragonguard details the construction of Alduin's Wall in the First Era. The temple is mentioned in the book The Rise and Fall of the Blades. Alduin's Wall was called Reman's Wall at some point in development of the game, as hinted by concept art. Not all the followers that you recruit into Blades will stay here. Check your follower's page before adding them as some tend to run between here and their "former" home. This page was last modified on 20 December 2018, at 14:01.